Where to buy, when to buy, and how to buy. 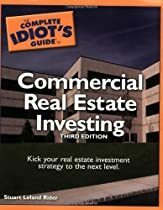 Updated and revised, The Complete Idiot’s Guide to Commercial Real Estate Investing, Third Edition, is a must-have reference book for aspiring commercial real estate investors/developers. What little coverage of residential income properties that existed in previous editions has been cut, and the remaining content has been updated to clearly reflect the focus on buying and selling commercial properties.